The Triaxe Sport has a pull out luggage rack and LED front headlight. It offers front wheel drive and has adjustable handlebars. 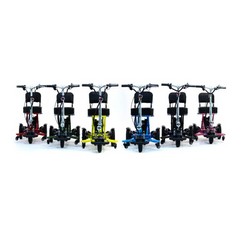 The Triaxe Sport comes with rear disk brakes and a main parking brake as standard. The comfortable cushioned seat is 13 inches wide (Or Optional 18 Inch Seat) with an optional 18 inch seat available.